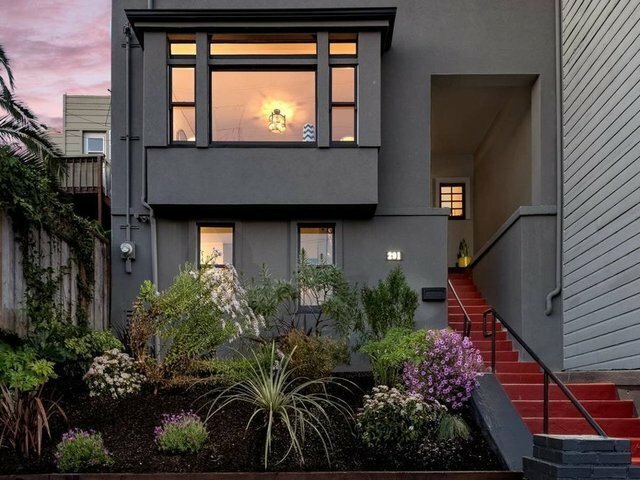 This one-of-a-kind single family 3 bedroom, 1.5 bath residence in prime Bernal Heights has a street-to-street lot and backs up to beautiful Holly Park. The open green space is a friendly dog & people park and boasts a playground, tennis court, baseball field, & basketball court. This coveted location is minutes to Cortland Street's many charming cafes & shops. The open floor plan features a spacious living room with tall ceilings, a new gas insert fire place, and an abundance of natural light. The dining area showcases original historic details including stunning built-in’s. The chef’s kitchen offers all new stainless appliances, Virginia Mist granite counter tops, LED lighting, and a charming eat-in nook. Enjoy coffee from the newly refinished deck overlooking verdant Holly Park. The expansive basement has a laundry area (New washer/dryer included) and lots of storage. All new White Oak engineered hardwood floors throughout. Thoughtfully and exquisitely restored, along with a prized location, make this home’s appeal extraordinarily special.